London, 11 June 2018: The INSURTECH Book is officially launched today at the Shard, London where contributing authors fly in from around the world to discuss digital trends in Insurance with the leaders of UK’s insurance & insurtech industry during London TECH Week. This was the result of globally crowdsourcing the most cutting-edge insurance knowledge, led by Susanne Chishti, CEO of FINTECH Circle & the FINTECH Circle Institute. By shortlisting writers from hundreds of key industry figures, these successful InsurTECH entrepreneurs, insurance professionals, thought leaders and investors went on to write chapters for The INSURTECH Book, the latest edition of The FINTECH Book Series published by WILEY. 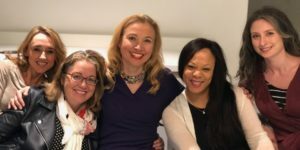 As Editor in Chief Susanne Chishti, selected 3 insurtech and fintech leaders – a powerful All-Women Editorial Team consisting of Sabine VanderLinden (CEO & MD Startupbootcamp InsurTech), Shân Millie (Insurance Board Advisor & Growth Specialist) and Nicole Anderson (multiple CEO and Fintech Entrepreneur). The team worked closely with Gemma Valler, Finance Editor of WILEY to create The InsurTECH Book which already has reached the 2nd place on the Amazon Bestseller List. The INSURTECH Book is a technology handbook for investors, entrepreneurs and FinTech visionaries, a ground-breaking guide to the disruptions, innovations and opportunities that technology affords the insurance sector. Presenting the insights, current thinking and actionable strategies from international topic-expert contributors, it explains why traditional ways of doing business will soon become irrelevant and offers a guide to thriving in the digital insurance revolution. The Global Launch Event of The INSURTECH Book takes place in London, on the 11th June at 6pm at the Shard. Event information is here. SABINE L. B. VANDERLINDEN is the CEO and Managing Director of Startupbootcamp InsurTech, Europe’s leading early-stage and independent accelerator for insurance technology start-ups, Rainmaking’s corporate innovation and growth venture focused at the insurance and InsurTech spaces. She is also the founder of the Proposition Circle, an innovation advisory platform she uses to coach young businesses and advise investors. SHÂN M. MILLIE is a Board Advisor, Business Coach and hands-on Growth and Strategic Communications Specialist. Highly-respected in UK General Insurance and InsurTech, she founded own Growth consultancy, Bright Blue Hare, in 2016. NICOLE ANDERSON is a multiple times CEO, a FinTech entrepreneur and advisor with a strong track record at board and general management level across international markets. Over the last 10 years she has worked across multiple segments within the Financial Technology markets, including payments, wholesale banking, transaction services, forex, wealth management, as well as traditional retail and supply chain management. SUSANNE CHISHTI is the CEO of FINTECH Circle, the FINTECH Circle Institute and co-Founder of The FINTECH Book Series. She is recognized in the European Digital Financial Services ‘Power 50’ 2015, an independent ranking of the most influential people in digital financial services in Europe and has been selected as “City Innovator – Inspirational Woman” in 2016. She has also been a fintech TV Commentator on CNBC. She worked for 15 years in senior positions at Deutsche Bank, Lloyds, Morgan Stanley and Accenture. FINTECH Circle is a global community of 120,000+ fintech entrepreneurs, angel and VC investors, financial services professionals and fintech thought-leaders, focusing on FinTech seed investing, education and enterprise innovation. FINTECH Circle’s CEO, Susanne Chishti, co-edited The FINTECH Book published by WILEY in 2016 which became the 1st globally crowd-sourced book on financial technology and a global bestseller across 107 countries in 5 languages. The latest additions to The FINTECH Book Series are: The WealthTECH Book focuses on the disruptive changes in the global investment/wealth management and private banking sector and The InsurTECH Book focuses on digital disruption and transformation across insurance, both published by Wiley. The FINTECH Circle Institute is a fintech learning platform, designed to empower finance professionals with the necessary digital skills to adapt to the rapidly changing industry. With board members ranging from traditional banks and FinTech experts, through to academics from leading universities, we offer courses on topics including WealthTECH/Robo-banking, InsurTECH, RegTECH, Blockchain, Artificial Intelligence, Enterprise Innovation and Startup methodologies. Every quarter new bite-size classes are released to ensure that members have access to the latest FinTech insights and industry experts working on the most cutting-edge fintech innovations globally.